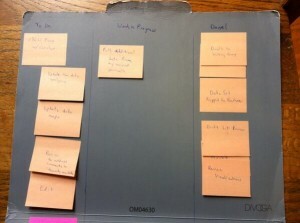 Create a Kanban board: Kanban boards have three columns: Backlog/To-Do, Work-in-Progress, and Done/Completed Tasks. I usually use a big sticky note (easel pad size) on the back of my office door for my Kanban board. A file folder also works, though, if you need something more mobile. Search databases for new scholarship on undergraduate research as a high-impact practice. Read and annotate the recently published texts. Add annotations to my Zotero library and share them with my collaborators. Add annotations for frequently cited publications and other key texts to Center for Engaged Learning website. Use the synthesis grid to draft a Center for Engaged Learning blog post. Revise, edit, and post the blog entry. Prioritize your backlog tasks and select your first tasks to complete: Limit your work-in-progress tasks. From the backlog list above, only the first three bullets are in my work-in-progress (WIP) column right now. Everything else stays in the backlog column until I’ve moved one or more WIP tasks to the Completed Task column. In essence, limiting the work-in-progress to a few tasks keeps the project from becoming overwhelming and allows you to focus on prioritized tasks. Routinely update your Kanban board to visualize your progress: When you finish a task, move it to the Completed Task column. Enjoy the psychological benefit of visually acknowledging that little win. 🙂 Then select the next task from your backlog to move to the WIP column. Each time you update the columns, you have an opportunity to reassess your priorities and to adjust the backlog tasks if needed. Because I often have multiple writing projects in different stages of completion (e.g., one that’s still in a data analysis stage, one that’s drafted and waiting for writing group feedback, etc. ), the Kanban on my office door typically has three or four writing projects listed – each with its own row on the board. Yet, I limit my work-in-progress tasks across projects to keep the tasks manageable. In other words, I don’t assign myself 5 WIP tasks for each project; I assign myself no more than a combined total of 5 WIP tasks. If you are new to Kanban, try it out with one project and see how it works for you. And if you’d like to learn more about this and other agile strategies and their relevance to the scholarship of teaching and learning, check out this Center for Engaged Learning Youtube playlist (featuring Rebecca Pope-Ruark).